Toyota Prius, the world's best-known and highest-selling hybrid car, sold over two million units worldwide in the last 15 years but only 150 vehicles in India last fiscal. So far this financial year, not a single Prius has been driven out of a Toyota showroom in the country. The Prius experience is illustrative of the dismal state of affairs in the electric vehicle arena in India, which has sales of a paltry 83,000 vehicles compared to over 4 million cars and scooters sold in the country. That may change. The government is expected to roll out a policy for hybrid and electric vehicles (xEV) this April after over a year of consultations. Yet, while all indicators for India's auto future point roughly in the "electric" direction, India's blueprint for success may require adopting a balanced three-pronged strategy: create infrastructure; provide crucial subsidies; fund essential research and development (R&D) programmes. For lessons on how to do this, we could look at China's recent electrifying performance. Between 2002 and 2006, Beijing spent at least $200 million on New Energy Vehicle (NEV) programmes, with plans to put out another $15.15 billion into an alternative energy vehicles development plan during 2011-2020, much of it going into bolstering R&D programmes, with the remainder to be spent on subsidies and infrastructure creation. Undertaking such massive financial interventions is a strategy that has worked well for China, the world's largest car market by volume, and has helped it emerge as a frontrunner in the EV sector; some forecasts even predict that China's EV market could grow to become the world's largest by the end of this decade. In contrast, the first tangible governmental support for the xEV industry in India came only at the end of 2010, with the Ministry of New and Renewable Energy (MNRE) creating a minuscule Rs 95 crore ($19 million) incentive scheme for manufacturers and the government subsequently slashing the import duty on batteries from 26 per cent to four per cent. The scheme provides for incentives of up to 20 per cent on the ex–factory prices of the vehicles, subject to a maximum limit, which is Rs 1 lakh for an electric car. But it isn't merely the incredible disparity in monetary support that differentiates the trajectories that the two countries are taking. China's automotive sector thrives on the collaborations that exist between strong domestic players and international majors, such as those between Germany's Volkswagen and Shenzhen-based BYD Automobile or General Motors and SAIC. At the same time, the presence of some of the world's biggest rechargeable battery manufacturers, by virtue of the booming cell phone and laptop industries in China, alongside growing mobility demand in a country with serious environmental concerns, creates a near-perfect situation for the xEV market to thrive. "In India, only Tata and Mahindra & Mahindra are domestic manufacturers of some reckoning. Any technology that comes in here would be driven by global manufacturers, rather than local R&D. In China, the government has $15 billion to spend on EVs and the domestic players are strong enough to do the R&D," said Deepesh Rathode, Managing Director of IHS Automotive India. Since India has negligible volumes, little money and, so far, fleeting ambition to take a big (and expensive) leap into the xEV sector, Rathode is convinced that growth in the sector has to be infrastructure-driven. Others, like Bill Russo, President of Beijing-based consultancy Synergistics, and a keen observer of the Chinese xEV market agrees. "I do believe infrastructure investment is a 'price of entry' which can drive market acceptance of a new technology," he says. "This, by the way, was also true for gasoline powered cars in the early 20th century. Consumers need to know they can conveniently service and recharge their vehicles before they would even consider buying. Infrastructure is a 'foundation' for driving xEV market acceptance," he added. Indian EV makers, however, are pitching for higher subsidies to drive initial demand, on the premise that infrastructure can follow once there are enough such vehicles on the road. Consumers, typically, are reluctant to buy xEVs that exceed the price of conventional vehicles by more than 10 to 15 per cent. “There should be a good incentive for consumers. Once the demand side gets going, in turn it will make other things viable,” said R Chandramouli, chief of operations, Mahindra Reva Electric Car Company, which sells between 30 to 40 units per month in the domestic market. Bangalore-based Reva, now a part of Mahindra & Mahindra, is the maker of one of the world’s highest selling EVs— the REVAi, which is exported to 24 countries. The carmaker is in the process of setting-up a 30,000 unit per annum plant, making it the single-largest electric car manufacturing facility anywhere in the world. Pawan Goenka, president, automotive division and farm equipment sectors, Mahindra & Mahindra, is more explicit. “Without the subsidy currently provided under the MNRE scheme it would be difficult to enthuse buyers to purchase electric vehicles. EVs have to be subsidised to encourage use by consumers. The quantum of the outlay made would determine how serious the government is about green vehicles,” he said. There is little doubt that the government is serious. The National Hybrid / Electric Mobility Study, conducted by Booz & Company, on behalf of the Ministry of Heavy Industries and Public Enterprises and the Society of Indian Automobile Manufacturers (SIAM) makes a strong case for pushing the xEV sector in India. It outlines the need interventions required to support the growth of the hybrid/electric market can be classified into five areas—fuel efficiency regulations, demand-and-supply- related interventions, research and development support, and infrastructure investments. "To achieve the tipping point for the market, the first step is to bridge this price–performance gap for consumers, and bring acceptable products into the market through demand side and supply side interventions. In parallel, the industry also needs to invest in building manufacturing and technology development capabilities. Along with this, power and charging infrastructure investments need to be made to facilitate adoption" a summary of the study states, adding that by 2020, a self-sustaining stage can be targeted for the industry. But it's the government's strategy, rather than its intent, that will be crucial in determining the eventual success of India's xEV push. At the same time, any blueprint must also leverage the existing advantages that India Inc offers, much like how China's EV industry has benefited from the presence of large rechargeable battery manufacturers. "India's largest potential opportunity is in the area of BEV 2W (Battery electric vehicle, two-wheeler) and HEV 4W (hybrid electric vehicle, four-wheeler) segments. These are areas where many Indian manufacturers, who understand the nuances of the market, can take the lead in offering frugally engineered and affordable solutions," explained Russo. Reva's Chandramouli, too, felt that bringing the cost of EVs down is something that the Indian firms could achieve. “The difference India can make is to make EVs more affordable, and for it to happen there needs to more R&D in this segment”. In particular, there may be significant opportunities in the two-wheeler EV vertical, which could comprise between 3.5 to 5 million of the total 5 to 7 million EVs that may be annually sold in India by 2020, according to the Booz & Company study. While the future of the Indian automotive sector may very well be down electric avenue, what remains to be seen is how we’ll all get there. Chinese version of the popular article originally published in Strategy & Business magazine by Edward Tse, Bill Russo and Ronald Haddock. Feb 28 (Reuters) - When China's leader-in-waiting Xi Jinping pulls up in a motorcade sometime in the next decade, he will probably not be riding in one of the black Audis that have become standard for Chinese top brass. Instead, if Beijing implements new rules requiring the government to buy only local car brands, he will likely emerge from a Red Flag limousine, the boat-like chariot that ferried around Chairman Mao Zedong from the 1950s to the 1970s. The move, announced over the weekend, is not final and would likely have a limited effect on foreign automakers in China, since government fleet sales account for less than 10 percent of car sales, according to some estimates. But the policy is good news to Ling Liang, a sales manager at an FAW dealership in Beijing, where only two cars sat in a dimly lit showroom, with no customers. "We have long tradition and experience, more than other Chinese brands," Ling said of FAW Group, whose brands include Besturn mid-range sedans and the former Red Flag. China is the world's largest auto market, but the legions of mostly German cars with tell-tale license plates bearing government, military and police designations are seen by some as diminishing that achievement. And premium government sedans often flout traffic laws, frequently engendering resentment from a public which sees them as symbols of abuse of power and a widening wealth gap. The government's diktat has not been explained publicly. The ministry posted a statement on its website saying only that Chinese brands must be purchased for government fleets, and asked for public comment. It's believed however to be an attempt to put a more Chinese face to government convoys, and mollify public indignation over extravagant and arrogant behaviour by officials. "Chinese people are fed up with 'the three excesses' of public officials: fancy cars, fancy meals and fancy travel," said Xu Guoliang, a 36-year-old architect who was getting his A6 serviced at an Audi dealership in Beijing. 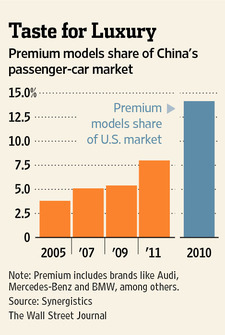 China is Audi's biggest market. It is the largest German luxury marque here, but its government sales in China reach only into the low single-digit percentage; the bulk of its customers are companies and individuals. Besturns are more modest - the B50 with a 4-cylinder, 1.6-liter engine and the B70 with a 2.0-liter six-beater. "They're also more affordable," Ling says. An Audi A6 starts at 390,000 yuan ($62,000) and goes up to 700,000 yuan ($111,000) - which could buy you more than seven entry-level Besturn B50s, which start at 93,800 yuan ($15,000). Even the most lavishly apportioned Besturn B70 sells for 165,000 yuan ($26,000), little more than half the starting price of the cheapest Audi, the compact A3 at 260,000 yuan ($41,000). FAW is planning to revive the Red Flag brand, working on a project called the C301 which will rival the A6 when it debuts. With 14.5 million passenger cars sold in China last year, annual government purchases of some 80 billion yuan ($12.7 billion) are still a small slice of the overall market, which is dominated by increasingly wealthy individual consumers. But domestic carmakers such as SAIC Motor, FAW Group, Great Wall Motor Co Ltd and Chery, which produce extended-wheelbase cars, could get a boost from the policy. "It's good that we're getting some support from the government," said Victor Yang, spokesman for Geely Automobile Holdings Ltd. "But we should be counting on ourselves, not the government, to improve our competitiveness." Audi, owned by Volkswagen, has by far been the preferred brand of Chinese officialdom going back to the 1980s. "It's luxury, but it's low-key," said Wang Yang, an Audi sales consultant in Beijing. "A lot of Chinese don't like to show off." Sales of foreign automakers are not expected to suffer much. "It's like asking an American car company, 'Are you going to suffer from not selling as many taxis'?" said William Russo, an industry veteran who runs the auto consultancy Synergistics in Beijing. "Beijing's new rule gives them the perfect rationale to really push to reposition themselves away from being officials' cars to being business-owners' cars," he said. "It will make foreign companies more competitive in the business-owner segments." However, the government list did not include luxury brand Volvo, which is the only Chinese-owned premium brand currently in the market. Red Flag and SAIC's Roewe could benefit the most, as they are the only Chinese brands that come close to the plushness and leg-room of an Audi or a Mercedes-Benz. Already, some state clients are turning to Chinese brands. "Most of our clients are consumers, but we do have some government clients, especially for the Roewe 750 model," said Wei Jia, a manager at an SAIC dealer in Beijing. "It's a good car and not that expensive. I'm sure the new policy will help our sales." In the gridlocked streets of China's cities, frustrated motorists are used to Audi-driving officials speeding down cycle lanes, illegally parked outside luxury malls and driving the wrong way along one-way streets. A new list of cars that government officials can drive excludes foreign brands and directs China's bureaucrats to buy cheaper domestic alternatives. It is meant to kill two birds with one stone. Public anger at official waste and corruption is appeased. Domestic auto firms get a bigger chunk of the estimated 80 billion yuan ($12.7 billion) official car budget. It won't be that simple. The new list is at the consultation stage. Even if it comes into effect, implementation will be difficult. A move last year to restrict mid-level government officials to buy smaller, cheaper cars appears to have had little impact on sales. Dealers say officials evade restrictions and get the car of their choice anyway. In the event sales to officials do dry up, foreign luxury brands will continue to tap one of the fastest-growing sectors of the China auto market. Bill Russo, an expert on China's auto industry at Synergistics, says luxury cars account for only 8% of unit sales in the Chinese market, compared with 14% in the U.S.
As important, though Chinese companies like Chery and BYD are bumper-to-bumper in the budget end of the market, they don't have the technology or the brand image to make a dent on the luxury end. With limited domestic competition, Audi's China sales rose 29.2% year-to-year in the first three quarters of 2011, considerably outpacing growth in sales for the auto market as a whole. The new list is good public relations for a government keen to show it is cracking down on abuse of public funds. But it will be a while before China's citizens can hope to spy officials behind the black tinted windows of a domestic brand car. BEIJING (Reuters) - In 2005, Mercedes-Benz took a gamble and shipped its first batch of 200 sport utility vehicles from Germany to China, where cheap hatchbacks and black sedans ruled the roads. They shouldn’t have worried. Seven years later, SUVs — from modest Hyundais to gleaming, $500,000 Range Rovers — are muscling aside smaller cars on China’s crowded and chaotic streets. Chinese consumers bought 2.1 million SUVs last year, up 25.3 percent from 2010 and representing 11.6 percent of light vehicle sales, according to J.D. Power and LMC Automotive. That is about half of the 4.1 million SUVs sold in the United States, where SUVs were 32 percent of the light vehicle market. The increase in sales illustrates China’s car market is maturing, analysts say, and presents another opportunity for foreign makers to expand their presence in China. Mercedes sold 54,000 SUVs in China last year and the cars accounted for 27 percent of its total China sales in 2011, a nearly two-fold percentage point increase since 2007. In many ways, the Chinese infatuation with gas-guzzling SUVs is an unlikely one. Most car owners live in crowded, urban areas, with few opportunities for the rugged, dirt-road driving that features in car advertisements. But sitting high above the traffic in an expensive off-road vehicle has an appeal in China’s status-conscious society, especially for younger buyers. Land Rovers crowd Cao Jinwei’s showroom in Beijing where the long-time dealer says he increasingly sells to wealthy, younger customers. SUV sales also reflect a changing market, according to analysts. Beijing resident Enya Xie ditched her tiny, five-year old Suzuki Swift last summer for a 2.5 liter Subaru Forester, which was three times as expensive. J.D. Power and LMC statistics show female SUV drivers, mostly young professionals, have been increasing steadily in China, from 14 percent in 2007 to 19 percent in 2011. “The SUV is expanding its appeal,” said Jacob George, managing director of J.D. Power’s China operations. Mercedes wasn’t the first foreign carmaker to try selling SUVs in China. Nearly 20 years ago, Chrysler produced the Jeep Cherokee at its venture with state-owned BAIC, but failed to make any inroads because of quality troubles and its own restructuring. Today American carmakers have a comparatively small share of the market. Instead, Japanese and Korean makers prevail in the compact segment while German companies dominate the luxury segment. With an annual tally last year of some 160,000, Honda’s (7267.T) CR-V was the best-seller. Nissan’s (7201.T) Qashqai, Hyundai’s (005380.KS) iX35, Toyota’s (7203.T) Highlander, RAV4 and Kia’s (000270.KS) Sportage SL also made the top-10 list. Nissan, which started making the Paladin in China in 2003, saw SUV sales at its China venture surge 48.3 percent year on year in 2011, nearly twice as fast as the industry average. It added the Murano in September last year to its local lineup, which also includes the X-trail and Qashqai. Toyota, which started localizing SUV production in the same year, is now making Prado, Land Cruiser, RAV4 and Highlander SUVs in China. Local production can pay off quickly, even for relative latecomers. Volkswagen’s (VOWG.DE) Tiguan became the runner-up in the compact segment in 2011, only around 22,000 units shy of front-runner CR-V.
General Motors (GM.N), a leading player in the sedan and mini-van segment in China, has started to make the Buick Encore SUV locally and Ford (F.N) plans to build Kuga and possibly EcoSport SUVs in the country. Chrysler, hoping for a comeback, has pinned its hopes on local assembly of the Jeep Cherokee. For sales of expensive SUVs to continue on their upward trajectory, dealers will need more people like Chen Yuming, a 32-year old Beijing property developer. One SUV is not enough for Chen. He has three — a Porsche Cayenne, Mercedes G55 and GL450 — and can’t wait for the Mercedes G65 to hit the showrooms next year. Decades of fast economic growth have swelled the ranks of China’s rich and those customers are being drawn to European luxury brands. The luxury segment is growing fast. A total of 285,704 luxury SUVs were sold in the country in 2011, four times the 2009 level. Market share climbed to 13.7 percent from 8.4 percent, J.D. Power and LMC statistics show. The expansion has drawn European luxury brand makers to add SUVs to their local assembly lines. Audi, whose Q5 was the frontrunner in the luxury segment last year, will soon make the Q3 at its Changchun plant alongside the Q5, which first hit the market in March 2010. China-made Mercedes-Benz GLKs and the BMW X1, which rank second and third on the top-seller list, are also racing to make a debut ahead of the Beijing autoshow in April. Even Lamborghini, better known for sleek supercars than boxy off-road vehicles, plans to announce an SUV at the Beijing autoshow for a 2016 launch, according to people familiar with the strategy. Mercedes-Benz’s Maier says demand has barely been tapped.